Cody came into my life in January and he has passed from my life in January. He was somewhere around 13 years of age. 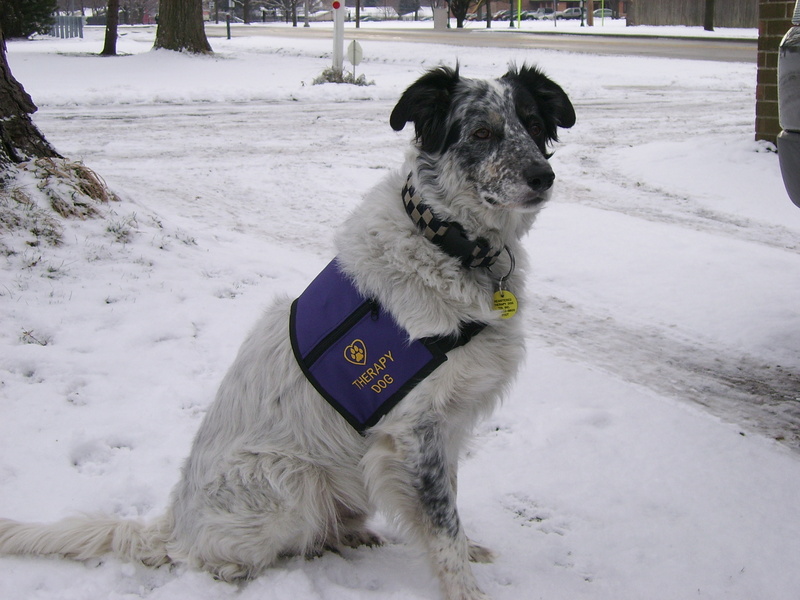 When I adopted him from Great Lakes Border Collie Rescue, he was around two years of age. For those of you who follow Cody’s blog, his stories are true and accurate. CHILDREN READING TO ME and FEAR OF DOGS CLASS merely scratch the surface of his amazing and wonderful life. With friends and family, I often referred to working with this Border Collie as, “Walking in with a Rock Star.” His gorgeous markings coupled with an amazingly affectionate, and curious demeanor always made him a fan favorite. In his three years of working The Fear of Dogs program, he worked with children who had been traumatized by dogs, and there were many who chose him to work with, to brush, to play with, to hug. Cody was a VERY steady performer and an absolute joy to work with. Unless, of course, a UPS, FEDEX, or U.S. Mail truck made an appearance. Cody’s final two assignments were on October 11th at an Assisted Living Facility in Lake Zurich and on December 1st at a Facility for Developmentally Disabled Adults. He was loved on, petted, and tears fell on his mostly white rough coat. He looked people in the eye and let them know that he loved them. I made the telephone call to the vet and set a 5:00 p.m. appointment. They promised a team would be ready for Cody’s crossing. Cody has always been eager to go for a ride in the car and this moment was no different. Did the repeated failure of his rear legs from our entry door to the Scion make this decision easier for me? I’d have to say, yes, without a doubt. Cody, Magic, and I stopped at McDonald’s for some hamburgers. Cody did have an appetite, and there was comfort in his enjoying of the burgers. And yes, he did bark in the car at every delivery truck he saw. As I mentioned in my earlier post, Cody may have given me permission to cross the bridge. Last night, just before midnight, Cody was up next to me, placing his gorgeous head on my chest. He has NEVER done that in the past, once he was ready for sleep, he pretty much stayed in his spot at the bottom of the bed on “his side.” I asked him if he was trying to tell me that he was “ready.” I knew that whatever arthritis, dysplasia, discomfort, pain, he had in his body would not be experiencing a miracle improvement. Without a doubt, the adoption from Great Lakes Border Collie Rescue of Magic on December 6th has provided me with a buffer in the form of another smart, sensitive, and intuitive Border Collie.. The thought of being able to reach over with my hand – anywhere – and not have a dog to love on was a burden I did not want to experience. Magic now provides this comfort and companionship. During the drive home from Preiser Animal Hospital, I had a long talk with Magic. He will be continuing Cody’s work on codemanbc.com. And, heartfelt thanks to Dr. Kristine Preiser and vet-tech Jamie for their compassion and gentleness with Cody, Magic and me. This entry was tagged border collie, border collie rescue, border collies, Crossing the bridge, death of a pet, dog behavior, dog rescue, dogs and people, herding dogs, life with a dog, old dogs, rainbow bridge. Bookmark the permalink. Oh Tom…….. My heart is breaking…..I have been where you were tonight and there is no better place to be than right next to them when they pass…. We owe them that for all they have given to us in their life time. The faithful attention, the patient waiting and the perfect wholesome joy we felt when being with them. Our animal companions, our confidante, our friend, our love….. Perfect love. I’m sorry Tom….. Cody was one of a kind, one of those rare dogs that we will talk about until we all meet again. Tom, I only met Cody a few times but he was obviously a special being. I grieve with you at his passing. But, as long as you remember him he will never truly be gone. Cody. What an incredible dog. What an incredible friend. What an incredible member of our family. I will miss him and I pray that I have the wisdom and courage to know when it is Bob’s time to join Cody. Love you Cody. You were something. Oh, Tom…..Deb Witt with GLBCR here. I remember when Cody came into our rescue. Over the years, your partnership with your beloved boy has meant so very, very much to the longer tenured volunteers. Out of hundreds of great second chances in forever homes, your example has always been held in my mind and heart as one of the very, very best. He had a perfectly fabulous life with you! My heart is so sad for you, and yet I’m so grateful that Cody got to spend time with Magic and share that beautiful baton before he passed it along. You are in my thoughts, dear man. You’re right that the anguish and sorrow is more during the time that leads up to the decision than the act itself which is an act of kindness. And that anguish is all ours because the animal isn’t thinking ahead to that moment. And as long as we have animals that live shorter lives than we do we are going to have to deal with those end of life issues. I know people who, in my opinion, let their pets linger far too long. You have made the right decision. I’m glad that Magic is there for you. I was thinking after my response to your earlier post that when I got back to the computer tonight I would tell you that I hoped you’d teach Magic to use the computer so he could take over Cody’s blog. Lovespeed, Cody. Run free, sweet fellow. Much love to you, Tom, and thanks for bringing Cody into the lives of so many folks who benefitted from his presence. Thanks also for being keenly attentive to Cody’s wellbeing in life and respectful when it came time for him to take leave. Not a small thing. Scritches, Magic ~ something tells me you’ll be a blog whiz, cutie. Look forward to hearing from you. Hugs to all. Hi Anarette, Thank you for the kind words. Your poem got the tears flowing again. Very difficult to be without Cody after an 11 year relationship. I am very fortunate that Magic came into my life when he did. Thank you. Tom and Magic. Let the tears flow for as long as needed. They are something else our furry friends, aren’t they? Anarette and Ms. Z. So sorry for your loss. Thank you for sharing Cody with us. I’m very sorry to hear about your loss, it’s heartbreaking that they tell you when its time and we can only hope we listen. Welcome Magic to your forever home. I am so very sad to read of Cody’s passing. I feel as though I knew him even though we never met. My Indy’s dad died last week at the age of 16 his owner could only say “it’s the end of an era” that is how I feel about Cody. Please accept my heartfelt condolences. 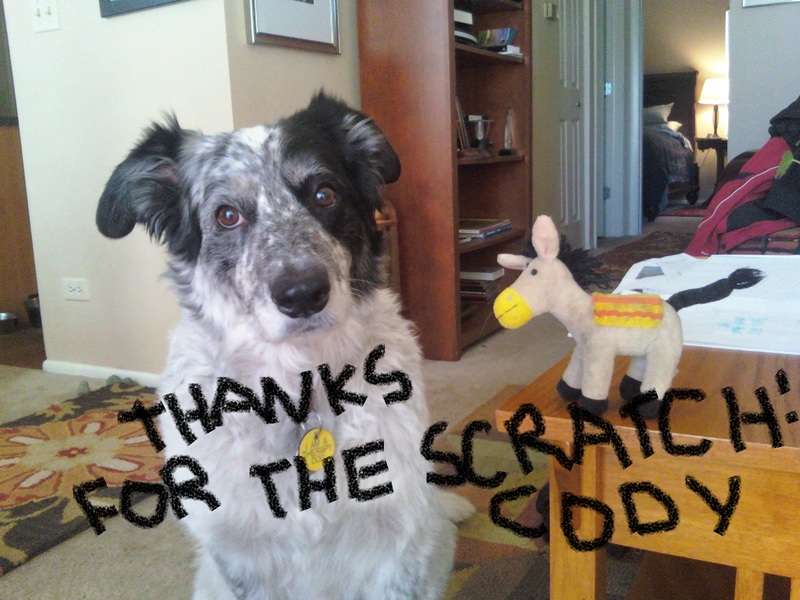 I have only just discovered your blog but I can already see just how wonderful a dog Cody was. I may not have been a follower long enough to see Cody’s journey but I look forward to seeing your future with Magic. It sounds like he has found the perfect home. My deepest sympathies at the loss of your best friend.